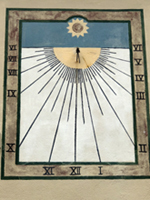 A vertical sundial painted on a southward facing wall of St Mary's of the Barrens church. 1811 W. St. Joseph St.
John E. Rybolt, “Notable Vincentians: Brother Angelo Oliva,” Vincentian Heritage Journal, Vol. 10: Iss. 1, Article 4, 1989. Available via the internet from DePaul University at http://via.library.depaul.edu/vhj/vol10/iss1/4.